The present volume of the EMU Notes' in Mineralogy series is associated with the 13th EMU School and contains chapters arising out of lectures given at this School, which was held at the Universidad de Granada (Spain) from 3-6 June 2013. The first transmission electron microscope (TEM) was built in the 1930s for which the inventor Ernst Ruska received a Nobel prize for Physics in 1986. Since those early years, Mineralogy has played an important role in the development of TEM methods and technology. In the beginning, early specimens included natural samples of biomineralization (diatoms in 1937), and later, some of the larger unit cells and microstructures of minerals were accessible to the low-resolution microscopes of that time (see chapter 5, for example). One of the main drives for the development of the electron microscope was its application in biology and medicine. Mineralogy would rejoin with biology at a time closer to the new millennium as interest in biogeochemistry became more prevalent (chapters 10 and 11). Through the following decades, the limitations of specimen thickness, contamination, beam damage and resolution were progressively overcome. In the 1970s, there were a few major influences on the application of TEM to minerals: the increase of resolution to the point of direct observation of mineral structures (see chapter 4 for minerals about which important discoveries were made at this time), the development of the ion mill to thin crystals to electron transparency, and the increase in funding for these new expensive machines to tackle problems such as lunar and extraterrestrial petrology (chapter 2). This decade also saw the increase in high-voltage technology that decreased the wavelength of electrons, and thus, increased their resolving power. We also saw the principles developed in 'Materials Science' being applied to minerals. Students of microscopy would probably be trained by both mineral crystallographers (to understand mineral structures) and Materials Science/Physics microscopists (to understand microstructures) (see chapters 3 and 8 for modem studies of defect microstructures and nonstoichiometery). Developing in parallel with the TEM was the dedicated scanning TEM (STEM). This technology would have a slower trajectory before establishing its importance in Materials Science, but has yet to be fully applied to mineralogy (see chapter 1 for a few examples of STEM applications). In the 1980s, universities were purchasing high-end TEMs for both Materials Science and Mineralogy. In several universities, Earth Science departments obtained scopes that were either dedicated to their own research or used for the university as a whole. Thus, the study of geological materials became more common. This was aided by the improvement of goniometric stages allowing orientation of samples, removing the need for the operator to pre-select a grain with adequate orientation. Two major analytical tools became available at this time: energy-dispersive X-ray spectroscopy (EDX) and electron energy-loss spectroscopy (EELS) (see chapter 1). Due to simpler implementation and interpretation, EDX rapidly became an integral tool in mineralogical investigations, whereas EELS, with its more stringent thickness requirements, more complicated interpretation, and more expensive instrumentation, would increase slowly in terms of its mineralogical applications. EDX allowed mineralogists to extend the acquisition of quantitative analyses below the micrometer threshold of the electron microprobe. This opened up the field of investigations into fine-grained materials such as sedimentary and low-temperature metamorphic rocks (chapters 6 and 7). The 1980s were a good time to buy a microscope, because the technology had stabilized and improvements in the 1990s were mainly in the area of computerization of the microscopy interface. However, the Schottky Field Emission gun became increasingly common during the 1990s, which did improve the STEM imaging capability and the spatial resolution of chemical analyses of conventional TEMs. In this decade, we began to see an increase in applications of TEM to environmental materials, biominerals, and the use of EELS to determine valence states of transition elements and produce energy-filtered compositional images. An important development in sample preparation and characterization came to fruition at this time through the methods of focused ion beam and dual beam instrumentation (these methods are not covered in this book, however). These tools enabled researchers to target specific areas for extraction and preparation into thin foils for TEM observation. They have also become important characterization instruments in their own right as nanoscale 3D reconstruction investigations of solids have proven valuable. The new millennium brought a breakthrough in imaging technology through the realization of aberration correctors on both conventional TEMs and dedicated STEMs which were now being remarketed. The resolution of electron microscopes, which had improved only slowly over the previous two decades, suddenly broke the l-Angstrom mark - we truly entered the picometer era. This came at the time when interest in nanoparticles in Materials Science, Chemistry and Physics was exploding. Parallel to that was the understanding of the effects of nanosized particles on the environment (chapter 9) and in health (for good and bad reasons). In addition, tomography techniques were developed to bring out the third dimension texturally and chemically (see chapter 11). Added to this, environmental TEMs enabled the observation of in-situ reactions under changing environments. So now in the 2010s, we are witnessing the push for the improvement of detectors for imaging (direct detection of electrons) and X-rays (silicon drift detectors and annular high solid-angle of collection detectors), the development of new support materials (e.g. graphene) and liquid cells for TEMs. Most of these new technologies have not yet been applied to mineralogical problems but we hope they will be in the near future. A new application using older technology is found in scanned precession electron diffraction (SPED). This technique can: (1) decrease the dynamical behaviour of electron diffraction, and thus, allow for the use of diffraction intensities for ab initio structure determination of nanocrystals; and (2) automatically produce orientation maps at the nanoscale. SPED is a recent development that has seen immediate applications to mineralogy. We have gathered in this book, reviews of past and current studies of mineral groups that have played important roles in geology, environmental science and health science. 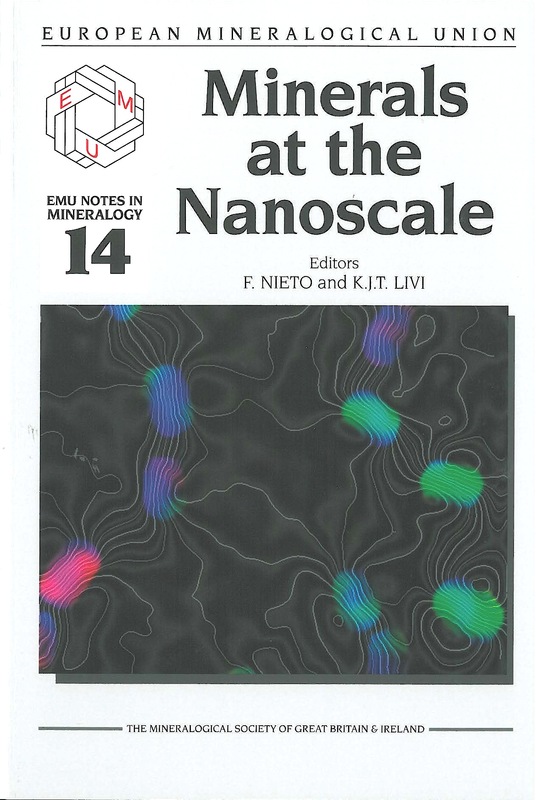 The various chapters cover the application of TEM and related techniques to: (1) mineral groups in which TEM investigations have been extensive and crucial to the understanding of their mineralogy, namely pyriboles (chapter 4), serpentines (chapter 5), clays (chapter 6), micas and other metamorphic phyllosilicates (chapter 7), oxides and oxyhydroxides (chapters 8 and 9), sulfides (chapter 8) and carbonates (chapter 10). Some research fields for which TEM is particularly suitable and which have produced significant advances, in particular, are inclusions and traces (chapter 1), extraterrestrial material (chapter 2), deformation processes (chapter 3), non-stoichiometry and superstructures (chapter 8) and biominerals (chapter 11). In previous years, both the therory and applications of TEM used for mineral studies have been developed extensively in specialized books (e.g. Buseck, 1992; Brenker and Jordan, 2010). Therefore, the fundamentals of the technique will not be developed here, and the reader is invited to find this information in the previous references and other general texts about TEM and related techniques (e.g. Williams and Carter, 1996). Nevertheless, some basic concepts to help with comprehension of the data described can be found in the corresponding sections of chapters 1 (imaging methods and Electron Energy Loss Spectroscopy, EELS), chapter 2 (EDX), chapter 3 (characterization of dislocations and related defects), and chapters 6, 7 and 11 (preparation of samples). xv + 440 pp. ISBN 978-0903056-34-2.